The noise in the arena was deafening, but Sebastian could barely hear it under the massive armour of his Gear. The King Cobra was moving at top speed, weaving back and forth between the blocks of ferroconcrete that dotted the arena floor. A rhythmic noise could be heard as bits of shrapnel from the near-misses of the Mad Dog's missiles bounced on the Cobra's tough alloy skin. His opponent was moving uncharacteristically slowly, launching rockets after rockets in his direction like a death-crazed fountain. Sebatian's trained reflexes immediately saw an opening. He skidded the huge King Cobra sideways on its treads, suddenly bringing it around to present its most heavily armoured face toward the foe. Incidentally, the motion brought its heavy main gun to bear in that direction as well. The Mad Dog's pilot had obviously not expected the heavy machine to pull such a daring move. It began firing all its weapons wildly, autocannon and machinegun rounds impacting all around the blue and orange Cobra but doing little damage. Sebastian allowed himself a thin simple before he pressed the trigger. 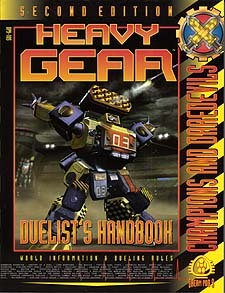 The Duellist's Handbook brings Heavy Gear players into the ritualized and violent world of mechanized duelling. The guardians of regimental honour, the stars of professional sports teams or the vicious gladiators of the underground. Duellists exemplify all the best and worst qualities of the Heavy Gear world. The Handbook examines the duties and lives of military, professional and underground duellists, and features new Gear and Mount models, duelling weapons. Perks and detailed rules for small scale tactical combat. Several prominent Duellists are also profiled and details are provided on the Badlands city-state of Khayr ad-Din and its army - an ideal roelplaying setting for Duellists.